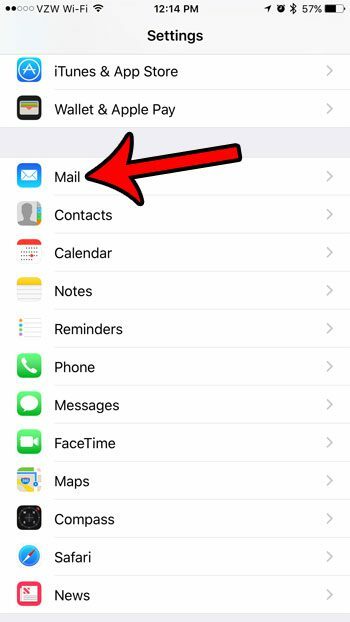 You might be wondering how to change the default iPhone email account if you have found that you are writing new email messages and they are being sent from an account other than the one you would prefer. 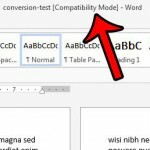 Or maybe you are tired of manually changing the “From” setting when you create a new email, and would prefer to use the one that you are always switching to. A few years ago not everyone had an email account, and even those that did have them were often sharing them with a spouse or family member. 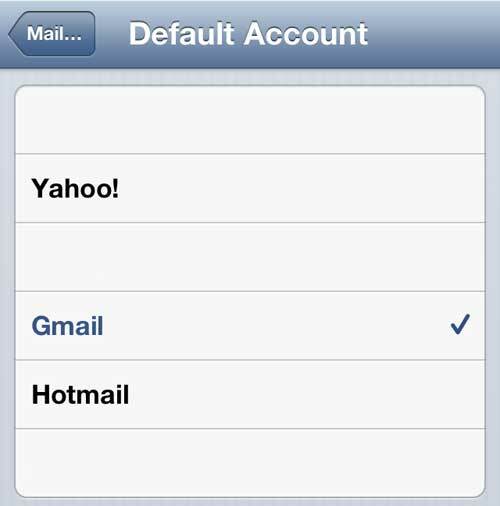 Now, however, it is extremely easy to sign up for a free email account like Gmail, Yahoo or Outlook. Aside from the ease with which a good email account can be obtained, the use of email as a primary means of communication has increased dramatically so, chance are, you probably even have several email accounts that you monitor. 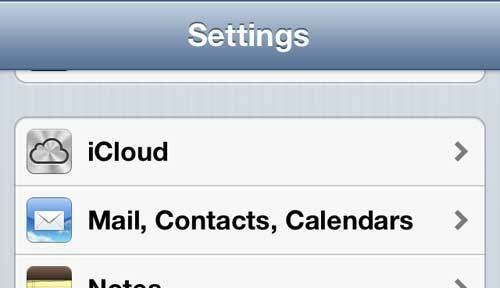 The iPhone realizes and even encourages this fact, so it is a simple process to have multiple email accounts on your iPhone 5. So if you have more than one email account on your device, but every new message that you create is being sent from an account that you do not want to send from, you probably need to change the default email account on your iPhone 5. 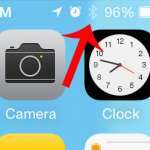 The steps in this section were written using an iPhone running the iOS 10 version of the operating system. 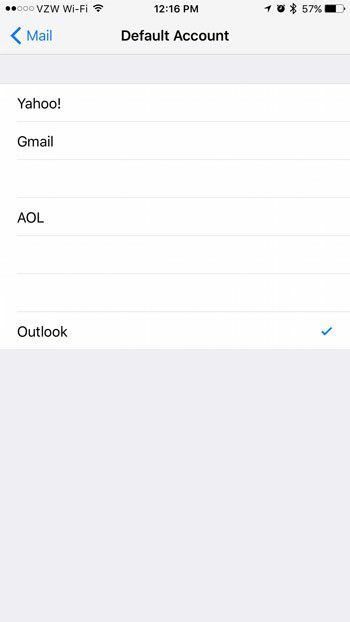 If your iPhone screens and menus differ from those shown here, then scroll down to the next section to see how you can set the default iPhone email account in iOS 6. Step 2: Scroll down and touch the Mail option. Step 3: Scroll all the way to the bottom of the screen, then tap the Default Account option. 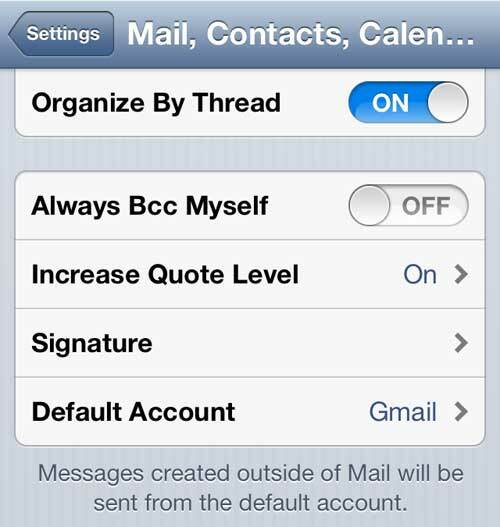 Step 4: Tap the email account on your iPhone that you would like to use as the default. It is important to mention that it is possible to cycle through your email accounts when you are sending a new message. Tapping on the From field in a new email message will open up a selection utility that allows you to cycle through the email accounts on your phone, allowing you to choose the account from which your current message should be sent. But this can be a hassle if you are always choosing a different account than the default one (the one that is always selected first when you create a new message), so changing your settings can greatly improve your efficiency when sending email messages. 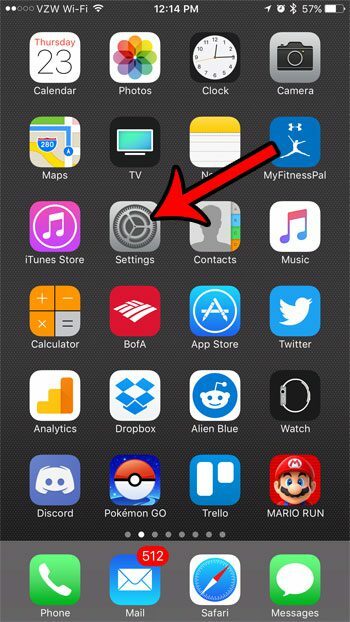 Step 1: Tap the Settings icon on your phone. Step 2: Scroll down to Mail, Contacts, Calendars and tap it once to open the menu. Step 3: Scroll down to the Default Account option and select it. Note that there are two Default Account options on this screen, so make sure you select the one that is under Signature, as the other option is for choosing your default Contacts. Step 4: Touch the account that you want to use as your default. The default account will be indicated by the check mark to the right of the account name. You can then exit this menu and start sending messages by default from the account that you have selected. Did you know that you can easily email a link to a Web page directly from within the Google Chrome browser application on your phone? This article explains how to do it. Why is My Word 2013 Screen Split Into Two?